Roll over is a trick I ﬁnd easiest to teach without a clicker, simply because most dogs don’t naturally roll over much and you might have to do a lot of waiting. Remember, with the clicker you have to wait for your animal friend to make the ﬁrst move so that you can reward the behavior you are looking for. If you have a dog who likes to roll a lot, feel free to follow her around with a clicker and click and treat every time she does it. Also, be aware that rolling over is easier for small dogs and dogs with a rounder body shape. For example, my Corgi picked it up right away and ﬂips into a roll with no problem. My Belgian Tervuren, on the other hand, has a little more trouble and sometimes gets “stuck.” To teach your dog to roll over, start with her in the down position (lying on her belly with her elbows on the ground). Then take a treat in your hand. Dogs’ bodies tend to follow their heads, and you can use this to your advantage. 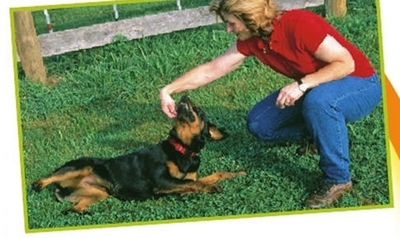 Starting with your hand close to your dog’s nose, lure her head around and back toward her rear. At the same time, begin to move the lure over her back. This should cause her to ﬂip over onto her side. Continue to lure her head in the direction she is rolling to get her to roll onto her back and then upright on the other side to complete the roll. At that point, praise her for doing such a good job and give her a treat. Warning: Roll over will take a lot of repetitions and patience on your part. The more you do it, the more your dog will begin to understand the trick. As she gets it, she’ll start to anticipate the roll and won’t need as much help. At this point, you can introduce the cue you’ve chosen, such as “roll over.” Before long, your dog will hear your cue and roll on her own.